wild beauty and make it the ideal place for inspiration and creation. 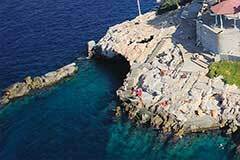 Close to the harbour is a beautiful rocky area with deep blue water, called "Spilia", which is ideal for diving. Some rocks can be used for sunbathing. 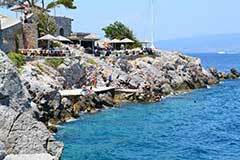 Next lies Hydronetta, which is located to the most beautiful place, under the cannons and on the rocks, to the same area as Spilia. You can also deep dive here and sunbathe on the cemented rocks. After Hydronetta there is Avlaki, one amazing small beach full of pebbles which is lighted at the night. 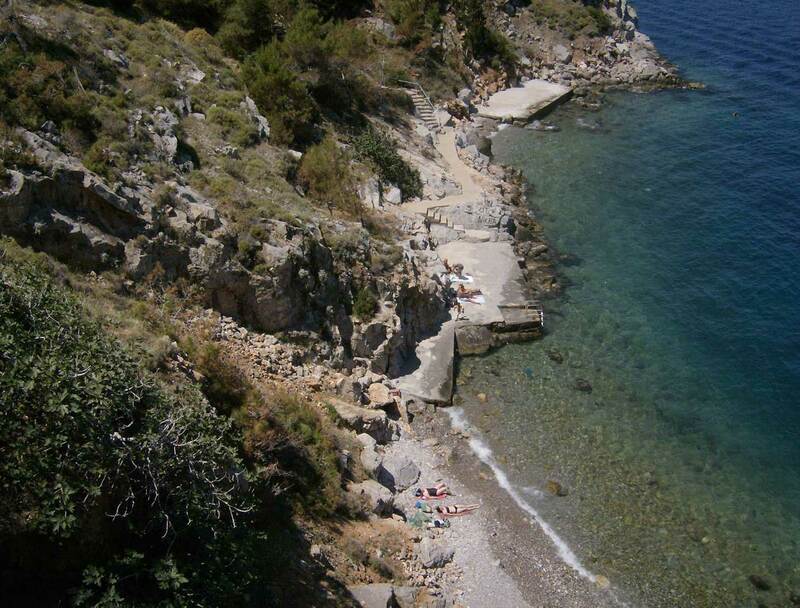 You descend from some stairs right after Hydronetta and you meet the beach with blue green waters and sunbathe places. 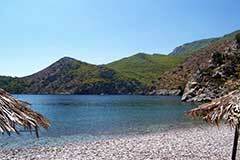 To the three above beaches you can go on foot, as they are only a few minutes away from the main port of Hydra. Also you can go to all the above beaches with a sea taxi or tourist's boats and small boats. Following the coastal road, we reach Kamini, one small and natural port full of fishing boats. Right next to it, there is Small Kamini, a beautiful small pebbled beach, ideal for children and sea games. At Kaminia, place for family tourism, there are rooms to rent and tavernas. Continuing the soily coastal road, we reach the beautiful, coastal settlement of Vlychos, with magical views and magnificent sunsets, which also is ideal for family tourism. 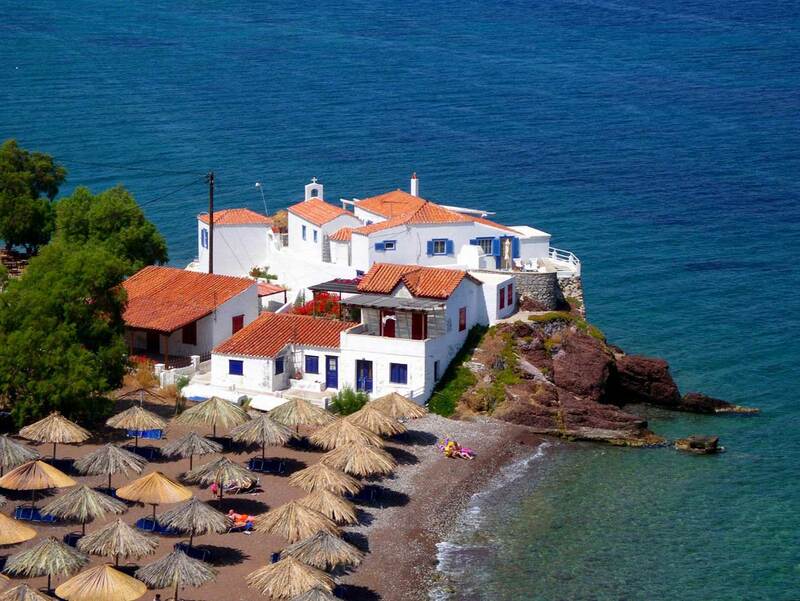 Bright white cottages and houses with spacious, full of flowers yards, are spread out and reach the hills above the beach. Among them, the quaint seaside chapels of St. Charalambos at the plateau of the peak of a rock emerging from the sea, and the one of the Saints Karpou and Papylou (1815) and St. Paraskevi which dominates the tempest tall rock by the beach, offering a unique and magnificent spectacle. 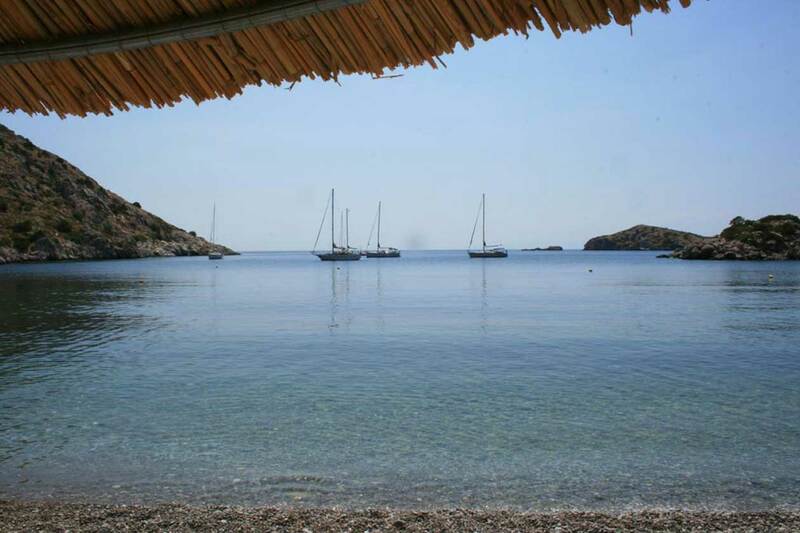 After Palamida, there is Molos, a close and quiet cove with a beatiful pebbbled beach, 70 minutes from the main port of Hydra. 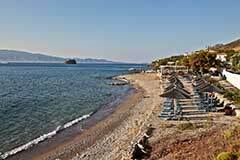 After Molos there is Kaoumithi, a non organised beautiful beach with large sand. Bisti is a cove at the northern of the island, surrounded by tall rocks. 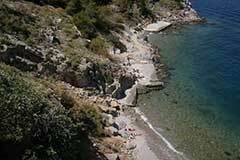 It is an organised beach ideal for water sports, deep diving and scuba diving, next to the pine tree forest. 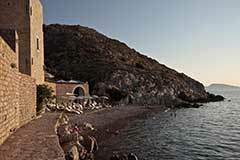 From the northern side of the island, we reach the cove of Saint Nikolaos. An organised beach eith pebbles and crystal clear waters and scuba diving. There are there sun decks and unbrellas with tables, beach bar with beverages and fast food and pine trees with shade. At some point there is also sand to play the kids. East there is Nisiza, a beautiful pebbled beach, non organised, in a cove, surrounded by pine trees. Next is Klimaki, a big beach, non organised, with pebbles and crystal waters, with some cottages and small Churches. 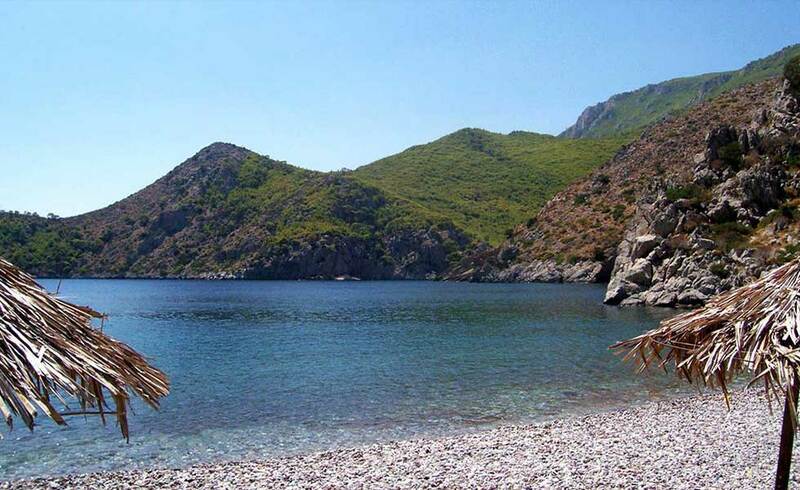 After the "Spilia tis Fokias" and "Rigas" , we are to the most beautiful beach, Limnioniza, with pebbles, non organised, which is offered for scuba diving. After Zouvra we reach Mandraki, the old port, where its entrance was protected by two small cannons. 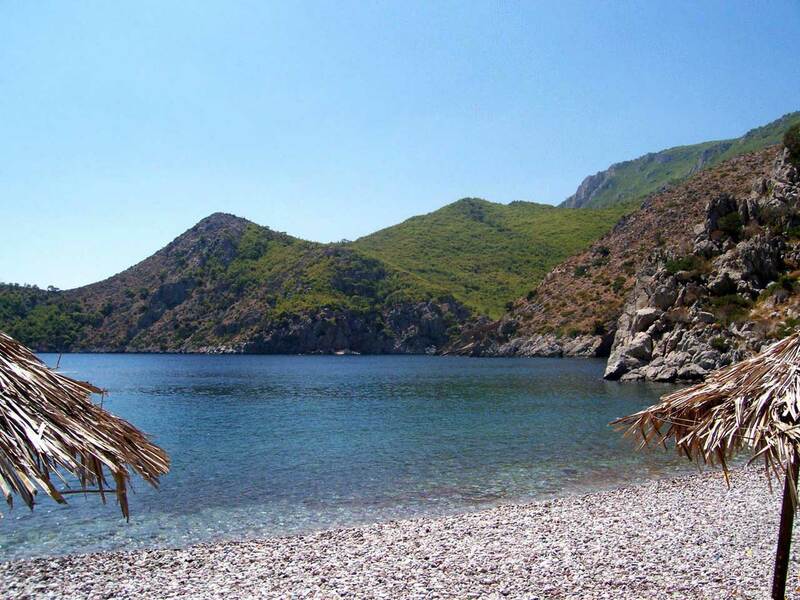 In Mandraki there is a beutiful beach, the only in Hydra without pebbles. 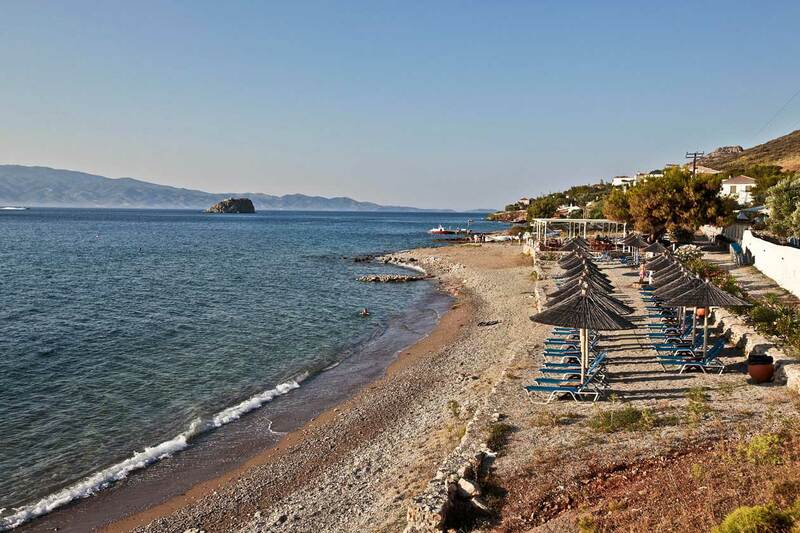 The beach is organised with water sports, beach bar, taverns and a hotel. 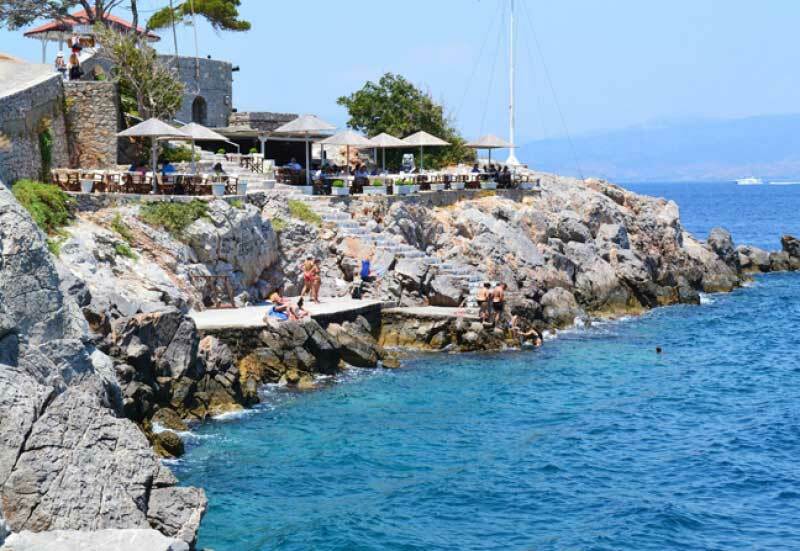 It is located only a few minutes from the port of Hydra island and you can go to Mandraki either by walking or with a sea taxi from the main port.